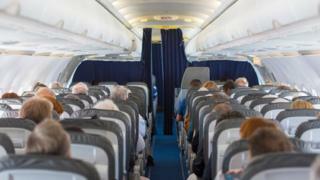 Travellers choose to sit on the right hand side of an aeroplane rather than the left, a new study has found. Edinburgh researchers found people's preference over which side they sit on was dictated by the "mind's rightward bias in representing the real world". The study was led by a Queen Margaret University professor and carried out at Edinburgh University. Thirty-two people, aged between 21 and 31 years old took part in the study. There were 21 women and 11 men. They were all right-handed and had normal or corrected-to-normal vision. The research was the first fully controlled study looking at where people would choose to sit on planes. The participants were asked to choose a seat by clicking on a seating plan diagram. They did this for 32 separate flights between fictional locations. The study was led by Dr Stephen Darling, a psychology lecturer at Queen Margaret University. He said: "It's been known for a while that people have lateral tendencies in laboratory experiments - people preferring one side to the other - but we were keen to establish if individuals had right or left preferences which they applied to domestic tasks carried out in the real world." Sergio Della Sala, professor of human cognitive neuroscience at Edinburgh University, was part of the research team. He said: "We were keen to rule out the possibility that participants may have just had a tendency to click one side of the computer screen. "Participants were therefore presented with seating diagrams with the plane facing either upwards or downwards. "The result clearly showed that the orientation of the plane made no difference to the preference, with most participants still making an active choice to choose seating on the right of the plane." Dr Darling added: "The research shows that people's preference as to which side they sit on in an aeroplane is dictated by our mind's rightward bias in representing the real world." The research paper "Fly on the right: lateral preferences when choosing aircraft seats" was published on 22 December 2017 in the journal "Laterality: Asymmetries of Body, Brain and Cognition."